I still haven't worn my down jacket yet, but it is getting cold and dry day by day in Tokyo. I hate the cold season because my skin dries!!! To avoid the dryness, I know I should better put layers of lotion and wait until my skin absorbs, but who wants to wait in the busy morning?! But if I skip this step, my skin always dries after I wore makeup... my skin is honest. 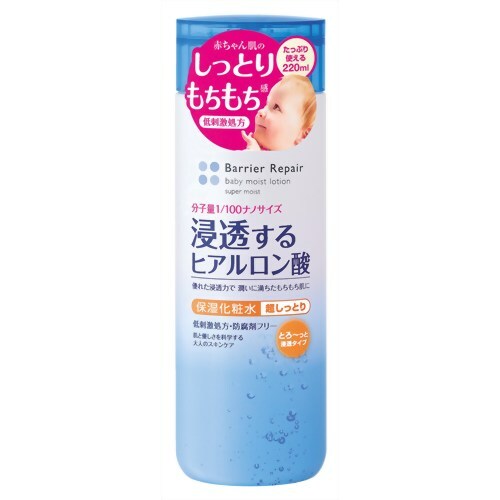 Anyway, last month, I got a free sample of cheap (7 bucks) lotion called Barrier Repair Baby Moist Lotion (Super Moist) from Mandom. I usually spend more (with whitening function) for my lotion, so I wasn't that interested in it at that time, but once I tried, I totally loved it!!! They have other products in line and I found their Repair Concentrate (all-in-one serum) is the best selling product. Maybe I should get a sample of it! But actually, I have my own serum, so it might not be my choice. Can't get too lazy. haha. I don't usually write a beauty product review, but I always label my non-food-related posts under others (see left side bar), so please find more there ;) Of course, you can find my reviews on Food and Drink Products reviews there, too!! !